Irony comes in many flavours, sweet to bitter. The harshest irony I ever tasted was this: when I was interrupted that spring morning, I felt only relief. But then, tyres on wet gravel sound nothing like the crack of doom. The noise caught me in the midst of an attack on the post overflowing my desk in Sussex. Since dawn, I’d been elbow-­deep in five months’ worth of pleas, adverts, requests for information now out of date, proposals of joint ventures similarly belated, legal and scholarly papers in need of review, and a thin handful of actual letters from friends near and far. I wanted nothing more than to haul the lot outside and set a match to it. When I heard the noise, I assumed it was Mrs Hudson, returning for some forgotten element of her morning’s trip to Eastbourne. However, the tyres sounded more tentative than Patrick’s hand on the wheel (Patrick Mason was my farm manager and our housekeeper’s occasional driver). Nor did the approaching engine sound familiar. A taxi bringing Holmes, perhaps, finished with his unspecified tasks for his brother, Mycroft? I hadn’t seen my husband since he’d left Oxford, two weeks before. But a glance through the library window showed an unfamiliar car with London number plates and a solitary figure considerably smaller than Sherlock Holmes. The driver circled counter-­clockwise, coming to a halt before the house. 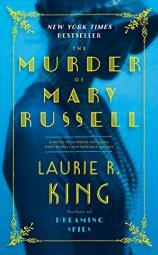 I headed to the door with a light heart: unarguable proof that Mary Russell had no talent for reading the future. I stepped from the front door into the roofed portico beyond, stopping as the fickle morning sunshine gave way to another quick shower. The driver’s door opened, but he hesitated, seeing not just the rain, but me. He’d expected someone else. “May I help you?” I called. “This is the place,” I confirmed. The shower grew stronger, spattering down the drive, and although the day was warm enough, I had no wish to change out of wet clothes. I turned to rummage through the odd population of canes, sticks, and tools in the corner of the entryway, but before I could locate an umbrella that functioned, the car door slammed and footsteps hurried across the stones. I let go the handle and gave the visitor some room under the shelter. He was a short, stocky man in his forties, wearing a new black overcoat, an old brown suit, and a cloth driving cap that he now pulled off, snapping it clear of drops before arranging it back over his blond hair. His brief question had been insufficient to betray an accent, but it had to be either Australian or South African—­his pale blue eyes positively blazed out of sun-­darkened skin, and his suit had a distinctly colonial air to it. I had just chosen Australia when his greeting confirmed it. With that greeting, I finally raised a mental eyebrow. A person’s first words can reveal a great deal more than the speaker’s origins. The closer one sticks to the traditional forms—­Good day, Madam, terribly sorry to bother you but . . . or a chatty variation such as, Dreadful weather for May, Ma’am, please don’t come any further into it, I just . . . —­the smoother the transition into a stranger’s life. But Nice place you got here, coupled with a blithe spattering of drops across the entry tiles and a grin that showed too many teeth? The man was out to sell me something. Had I actually been working that morning—­had I not been so grateful for any interruption at all—­I might simply have taken another step back and shut the door in his face. Might not even have gone out at all, for that matter, thus setting events off in a very different direction. But with nothing more compelling than a stack of mail to draw me, that self-­assured grin made for a nice little challenge. Another young woman might have said those words apologetically, or perhaps nervously. I merely stated them as fact. He gave me a quick glance, head to toe, taking in my short but decidedly unfashionable haircut, my complete lack of makeup, the old shirt I wore (one of Holmes’ with its sleeves rolled up), and the trousers on my legs. He reacted with a degree more sensitivity than I might have expected. His posture subsided, his bare grin gave way to something more polite, and he removed his hat again, this time a gesture of respect rather than convenience. Even his words reflected the change. I stifled my arm’s automatic impulse—­to catch that outstretched hand and whirl him against the wall—­and instead permitted him to grab me and pump away, grinning into my face. Still a salesman. After four shakes I took back my hand. “Sir,” I began. If he’d squatted down to tip me head over heels, he could not have astonished me more. Mother?? He saw my reaction, and gave a sort of smacking-­of-­the-­forehead gesture. “What am I thinking? Guess I’m a little excited. My name is Samuel—­Samuel Hudson. Great ta meetcha,” and the hand came out again to seize mine. Of all the mysteries that are love, maternal love may be the most basic. My own mother had died when I was fourteen. A few months later, with the raw instincts of a barnyard chick imprinting its affections on the first available surrogate, my bereft heart had claimed Mrs Hudson for its own. I had known her for ten years now, lived with her for more than four, and she was as close to a mother as I would ever again have. I knew of course that she had a son in Australia—­or rather, she had a “nephew” whom her sister claimed as her own. Glimpses of an older person’s complex and unspoken history can be startling, even when one’s main source of comparison is a dedicated Bohemian like Sherlock Holmes. Perhaps especially in that case: Mrs Hudson had always been a point of solid dependability amidst the anarchy that surrounded Holmes. Motherhood is more than a biological state. Yes, I knew—­well, suspected—­about her past, but I had never conducted the close investigation I might have with a stranger, and definitely never asked Holmes if Mrs Hudson had been married before giving over the child to be raised. I admit that a few weeks into our acquaintance, when it dawned on me that the nephew might in fact be a son, my first reaction was an adolescent giggle over the idea of Mrs Hudson as a fallen woman. My second reaction was curiosity. Oddly, Holmes refused to say anything about the matter. It took a while before I realised that his blatant unconcern was the only way he could grant his poor housekeeper (as if she wasn’t so much more than housekeeper!) some degree of privacy. Once I saw this, I followed his lead. I made no further attempts to rifle her possessions or read the letters from Australia—­written largely by her sister (who had died, some nine months before this) although Mrs Hudson’s interest clearly lay more in the news about their shared son. To judge by the sighs and a general air of distraction after each letter’s arrival, it was not an easy relationship. In fact, her “nephew” seemed to be something of a ne’er do well, but since she never asked for assistance or advice, we could only politely ignore her unspoken woes. Until now, when he stood on our doorstep. Assuming this was Samuel Hudson. Would most young women accept such a claim without question? Perhaps. And perhaps most young women would be justified in their naïve acceptance. However, I was married to Sherlock Holmes, had known him only a few hours longer than I’d known Mrs Hudson, and the basic fact of life with Holmes was: the world is filled with enemies. So, I would not permit this person to meet Mrs Hudson without a thorough vetting. All of this reflection and decision took me approximately three of the fellow’s hand-­pumps. I bared my teeth to make a grin at least the equal of his, and drew back to welcome him inside (which had the added benefit of removing my hand from his). I closed the door against the cool air and led him into the main room, our idiosyncratic combination of sitting room, library, and dining room. The south wall, to my right, had a table in the bay window, where we took our meals; the east wall held laden bookshelves, and French doors to the terrace; on the north lay a wide fireplace with chairs and a settee, along with the entrance to the kitchen. Holmes’ observation beehive, set into the wall beside the bay window, was behind its cover. “Whadda great room,” the visitor enthused. I bit off my tart response—­I’m sorry, it’s not for sale—­and instead turned the topic onto a more pertinent track. “Not to be rude, but I don’t suppose you have any sort of identification? You don’t look much like her.” Mrs Hudson’s grey hair had once been brown, not blonde, and her dark eyes were nothing like this man’s bright blue. Even if the fellow had been born “Samuel Hudson,” it was a common enough surname. He might be some lunatic with a Sherlock Holmes mania built around a minor coincidence. If so, this would not be the first fantasist to waltz into our lives, although the odds were mounting in his favour: he was certainly from Australia, and he knew not only our names, but where we lived. Still, the thought of that hand clamping down over Mrs Hudson’s beloved palm . . .
“Nah, guess I don’t,” he said, running a hand over his visage. “That’s probably why I never doubted who my mother was—­Mum and I both have my granddad’s looks, or so I’m told. Identification, is it? I didn’t bring my passport, didn’t expect—­ah, what about these?” His fingers came out of an inner pocket with a photograph and a golden chain. He handed me the first. It showed two women and an infant. The women sat in the formal pose required of a slow shutter speed, although it had been taken in a garden, not a studio—­a private garden, most likely, since neither wore a hat. The infant was as unformed as any small human, little more than pale hair and layers of cloth. The woman holding him was blonde, with light-­coloured eyes, and I thought—­as I had from the first time I’d seen this photograph, years before—­that there was something odd about the way the woman’s hands clutched the baby, thrusting him at the camera rather than cuddling him to her. Her features, too, had some faint air of hidden meaning, a triumph almost, that made one very aware of the empty hands of the woman at her side. The other woman, taller, straight of back and dark of hair and eye, looked into the camera with a gaze of sad acceptance. Even if I had not recognised this woman’s features, I would have known her by that expression: I see what you are up to, it said, but I love you anyway. Heaven knows she’d had plenty of opportunities to look at me that way, over the years. I handed the photograph back to Samuel Hudson. “She has a copy of that.” I did not add, Hers is worn down to the paper from ten thousand touches of her finger. My mother had used that very gesture, on the mezuzah at our door. I glanced up sharply at the bitter edge in his voice, to see his other piece of evidence dangling from thumb and forefinger: a gold chain strung through a hole drilled in an old half sovereign coin. “Does she still wear hers?” he asked. The chain looked too bright and the gold of the pendant less worn than I remembered, but the necklace definitely caught my attention. I’d never seen it around Mrs Hudson’s neck, but I recognised it as the flash of gold I’d first spotted years before, tucked in the bottom of her incongruously large and ornate jewellery box. I might have taken no notice, at the time, but for the casual haste with which she had flipped something over it. “No, she doesn’t wear one like that,” I told him.